Achilles Tang (Acanthurus achilles) | Better Know a Fish! Can’t you just imagine a model breezing down a catwalk in this dress? Just picture those deep-orange accents pop out against flowing, glossy black. Boom. But this is no simple design, no whim of the imagination. This dress is actually an exquisite adaptation of a colorful, real-life species — the Achilles tang (Acanthurus achilles), an algae-eating marine fish found in tropical Pacific waters. The dress is the work of designer and graphic artist Lindsay Prior, who is based in Canada. I happened upon Prior’s gallery after seeing a link to her fimbriated moray dress design in a blogpost over at Deep Sea News. Beautiful. I love it when artists find inspiration in nature, and find a way to elegantly translate these natural patterns and shapes into designs wholly brilliant on their own. However, there are two details in the dress that makes Prior’s design even more inspired. The “surgeon’s scalpel” on the dress design by Lindsay Prior and on the Achilles tang (Acanthurus achilles). Notice the blood-orange teardrop pattern below the waist, and the dark exclamation mark within it. This is not a stylized belly button — it actually mirrors the “scalpel” of the Achilles tang. 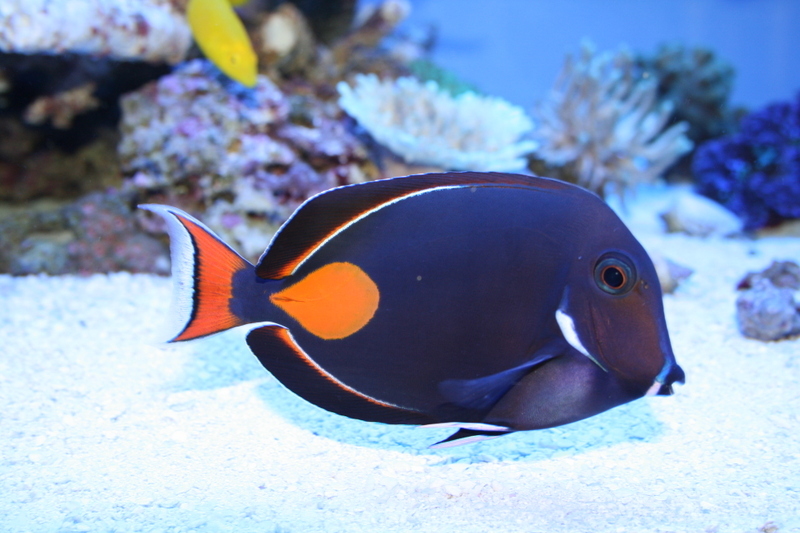 Tangs belong in Family Acanthuridae — better known as the “surgeonfishes”. They are called such because many species have a specialized, scalpel-like scale on each side of their caudal peduncle (the base of a fish’s tail). You can see this scalpel in the photos above as a faint, horizontal slit. Indeed, the name Acanthurus recognizes this very trait — it means “thorn tail” in Greek. The scalpel is typically in its resting position, nestled in a horizontal groove (Guiasu and Winterbottom 1993). When a predator approaches, however, these extremely sharp weapons flick out like a switchblade, allowing the fish to slash its tail defensively at the attacker. Now look closely at the earrings on Prior’s model — appropriately, they are shaped like sharp little daggers. Head over to Prior’s deviantART gallery to browse more of her creations, which include dresses based on the basking shark and the threadfin butterflyfish. Prior plans on continuing this design series, and I truly hope that someone will help her get these designs off the screen and sewn into reality. Then perhaps a fashion show fundraiser co-hosted by fashion houses and museums/aquariums, with proceeds benefiting marine research? Make it happen, people. Oh and of course, here it is, your Random Fish Video Set to Crazy Soundtracks… and this one set to Klaus Badelt’s Pirates of the Caribbean film score, I think? An epic score for a hungry fish waging war against… a sheet of dried seaweed. Obviously, the “Caribbean” part is inappropriate. But the Achilles tang certainly has an “epic” name. If you think all the way back to whenever you had to read Greek and Roman mythology for schoolwork, you might remember Achilles the Myrmidon as the hero of the Greeks during the Trojan War. Then of course you also remember that Achilles was the half-human son of the sea-nymph Thetis, who dipped baby Achilles into the band river Styx in order to make him invincible. But Thetis had held Achilles by his heels when she dipped him, so that his heels ended up not being touched by the magical Stygian water, and poor Achilles ended up with that fatal flaw — you can only hurt him by hurting his heels. And of course years later the Trojan prince Paris would shoot Achilles in the heel with a poison arrow, finally killing this invincible warrior. All of which gave rise to our English terms like “Achilles tendon” and “Achilles’ heel” — and eventually inspiring people to liken a blood-red spot on a fish’s tail to a mythical bleeding heel — enough so that the English naturalist George Shaw would record the species in 1803 as Acanthurus achilles, the “Achillean Acanthurus” — known to us today as the Achilles tang. Guiasu, RC, R Winterbottom. 1993. Osteological evidence for the phylogeny of recent genera of surgeonfishes (Percomorpha, Acanthuridae). Copeia 1993(2): 300-312. Shaw, G. 1803. General zoology, or Systematic natural history, Volume IV, Part II. London: George Kearsley. p187-632. Special thanks to classicist Dr. David DeVore for keeping me out of Charybdis by refreshing my memory of Greek and Roman mythology. Any further errors are my own, not his. This entry was posted in Actinopterygii, Marine Fish, Perciformes, Random Fish Videos Set to Crazy Soundtracks and tagged Acanthuridae, Acanthurus, Acanthurus achilles, Achilles, Achilles surgeonfish, Achilles tang, aquarium fish, art, Brad Bitt, design, fashion, graphic design, Iliad, Lindsay Prior, Pacific Ocean, Perciformes. Bookmark the permalink. Pingback: Celestial Pearl Danio (Danio margaritatus) | Better Know a Fish!